If you’re feeling rebellious about screen limits and have older children, compare your digital family plan with Nanea Hoffman, author of an inspiring no-screen limit article for the Washington Post. If you must share photos of your children on your social media sites, be sure to set the strictest privacy settings and share only with friends and family. Watch yourself for tendencies of oversharenting where you are divulging every action and movement (oh yes, I’ve read the posts about little Debby’s first movement). Before you hit enter, ask yourself: will this be embarrassing to your child when she is 18? Will her friends tease her? Will her boyfriend think her mom was whacked? The Internet is like Vegas: what happens online, stays online, so act respectfully with your child’s digital reputation as well. As with many online issues, experts are not in agreement regarding the affect of cartoons before school. Some say that a little bit of educational TV is okay, whereas others argue cartoons before school is not ideal because it is difficult for children to switch from fantasy mode to work mode. Several of the eSafety professionals that I know allow cartoons and educational TV in the morning in order to get out the door. And a little inside information, I’m pretty sure I watched every episode of the Jetsons (“Meet George Jetson…”) and Gilligan’s Island (“Just sit right back and you’ll hear a tale…”) and other than having chronic “theme show song-itis,” I turned out okay. You can use Internet and technology to teach your children and there is a huge range of educational apps and games. Don’t know where to start? Read reviews according to age for games and apps. Alternate online games with offline games. Go back to your own childhood and purchase your favorites: Connect 4, Candyland, Chutes and Ladders, Twister, Dominoes – the list is long. Opt for a paper book before an eBook of fairy tales for your baby. But if you absolutely must read electronically, use your voice to read, not the electronic narrator. Young children learn languages better by watching facial movements. Begin as you mean to go on. 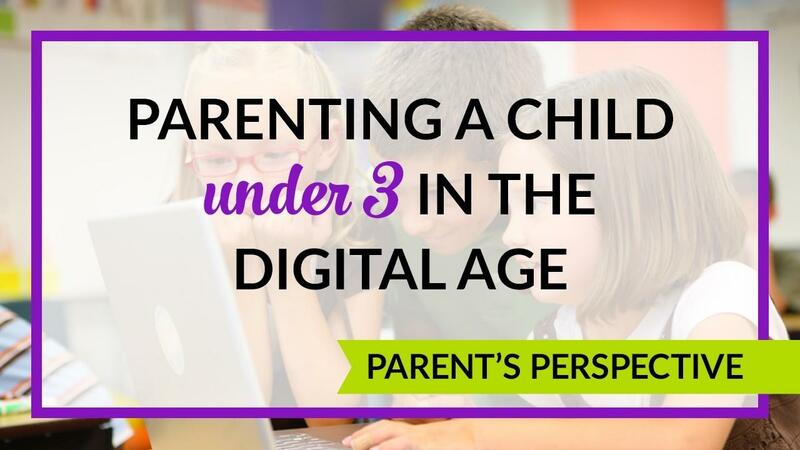 Parents of younger children are in a fantastic position to deal with digital parenting and set the rules and expectations right from the beginning. Like with any potentially “bad” thing (read: wine, chocolate, TV), moderation is the key. A healthy digital diet is a better way to live than to be obliged to wean and digital detox to recover a healthy balance. Don’t freak out because this is new and exciting technology. Being a parent hasn’t changed at all: you only have more toys to play with and you can easily bring your offline parenting skills online. Be a good role model yourself and use your devices in ways that you want your children to emulate. If for some insane reason, I didn’t answer your specific concern on digital parenting, shoot me an email at [email protected] I would love to hear from you. And if you like what you’re reading, please sign-up for my free newsletter FULL of tips and resources. Portions of this blogpost first appeared on Inspirelle.com in 2015.